Over the course of more than 20 years, Karima Bourquard has acquired a sound experience in health information systems Having started out in the development of solutions for health facilities, she then, over a period of about ten years, put her skills to work in the service of the GMSH (Hospital Information Systems Modernization Group), allowing her to develop numerous reference studies to insure the harmonious development of health IS (strategy and steering, patient identification, policies and charters, business processes, change management, interoperability …). It goes without saying that no harmonious development of IS is possible without intercommunication among systems. In this regard, Karima Bourquard is among the founders and co-chair of IHE France and IHE Europe. 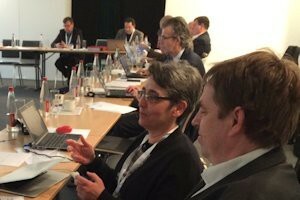 She is, along with users and suppliers associations, the one who introduced IHE profiles based, in particular, on HL7 and DICOM standards. She continues to pursue this activity within IHE Europe. make itself known, at the European level, in order to promote the emergence of a policy of innovation beneficial to users and professionals. Karima Bourquard, Franck Le Gall, Philippe Cousin. Standards for Interoperability in digital health : selection and implementation in an eHealth Project. Springer Verlag. Soon to be published.